My Place In The World: Bring DNTO to London! Sometimes the most incredible things fall into place randomly. And sometimes social media helps the process along. For example, one day I was simply retweeting some great songs by an artist I love and he sent a song out just for me! And that led to a friendship and a campaign to bring him to London. A year later, it worked. Reid, Carolyn and John came to London and played at the East Village Coffeehouse. Similarily, we (LdnOnt) brought CBC Q and Jian Ghomeshi to London through the power of social media. So, it should come as no surprise to me that the following story unfolded as the result of a few tweets. 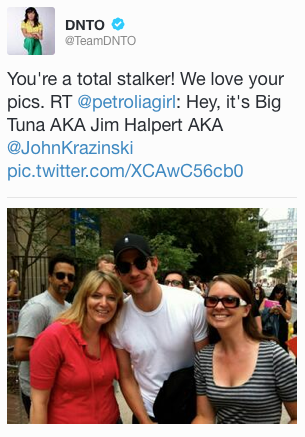 Last week CBC's Definitely Not The Opera asked their twitter followers to tweet photos of themselves with celebrities. Well, anyone that knows me, knows that I have plenty of those! I chose a select few and sent them out into the twitterverse. Immediately they were favourited and retweeted by DNTO. 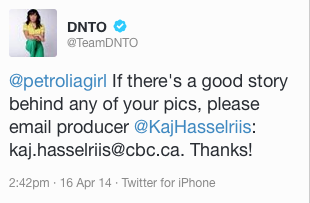 And a few minutes later, they replied to say if there's a good story behind my pics, please contact their producer. I sent a message off to let them know that I'm not completely crazy or a stalker, but just something Lisa & I do once a year. Well, we've had a few back and forth emails and it turns out I just might convince DNTO to take the show on the road and come to London! I mean, if it worked for Jian and Q, why not for SookYin and DNTO? How fun is that? Well, for a CBC fan like myself, it's a hoot. 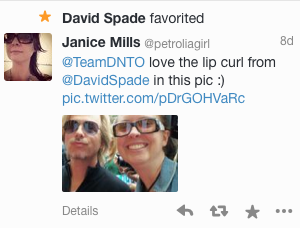 And, as a side note, David Spade (the REAL David Spade) favourited my tweet that included my pic with him. It's always fun when you get feedback from a celebrity! So stay tuned as this story unfolds. Can't wait to see what's in store!